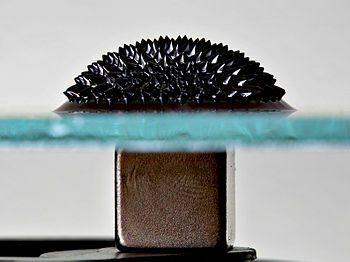 Ferrofluid on glass, with a magnet underneath. A ferrofluid (portmanteau of ferromagnetic and fluid) is a liquid that becomes strongly magnetized in the presence of a magnetic field. A grinding process for ferrofluid was invented in 1963 by NASA's Steve Papell as a liquid rocket fuel that could be drawn toward a pump inlet in a weightless environment by applying a magnetic field. The name ferrofluid was introduced, the process improved, more highly magnetic liquids synthesized, additional carrier liquids discovered, and the physical chemistry elucidated by R. E. Rosensweig and colleagues; in addition Rosensweig evolved a new branch of fluid mechanics termed ferrohydrodynamics. Ferrofluids are colloidal liquids made of nanoscale ferromagnetic, or ferrimagnetic, particles suspended in a carrier fluid (usually an organic solvent or water). Each tiny particle is thoroughly coated with a surfactant to inhibit clumping. Large ferromagnetic particles can be ripped out of the homogeneous colloidal mixture, forming a separate clump of magnetic dust when exposed to strong magnetic fields. The magnetic attraction of nanoparticles is weak enough that the surfactant's Van der Waals force is sufficient to prevent magnetic clumping or agglomeration. Ferrofluids usually do not retain magnetization in the absence of an externally applied field and thus are often classified as "superparamagnets" rather than ferromagnets. The difference between ferrofluids and magnetorheological fluids (MR fluids) is the size of the particles. The particles in a ferrofluid primarily consist of nanoparticles which are suspended by Brownian motion and generally will not settle under normal conditions. MR fluid particles primarily consist of micrometre-scale particles which are too heavy for Brownian motion to keep them suspended, and thus will settle over time because of the inherent density difference between the particle and its carrier fluid. These two fluids have very different applications as a result.